Cover Photo: © Getty Images, Inc.
Few phenomena that occupy the time of governments and economists are as ambiguously defined and difficult to measure as the “shadow" or "informal" economy. Those terms immediately make some people think of the guys who built an extension for their house and insisted on being paid in cash. Others remember the taxi driver who took them home after a late night out, and either didn’t have a meter or didn’t turn it on. Those who have been in very poor countries might recall bustling markets where you can haggle for anything from a handful of fresh chilies to a pair of sandals or even livestock. All of these are likely to be part of the unregulated and untaxed transactions that make up a country's informal economy. 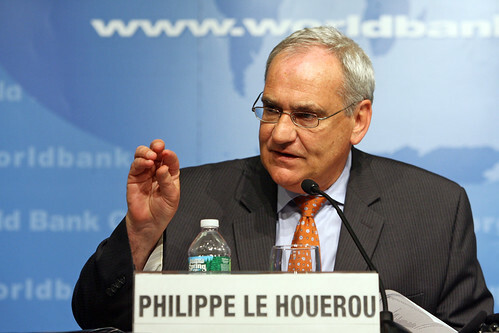 At a press briefing earlier today at the Spring Meeting, Philippe Le Houérou, World Bank Vice President for Europe and Central Asia, spoke of how the region has faced the greatest fiscal pressures among all the world's regions during the global economic crisis. "2010 is going to be a tough year for the Region with growth projected at around 3 percent. The prospects for 2011-2013 are only slightly better. Rising joblessness is pushing households into poverty and making things even harder for those already poor." The global financial crisis may be easing, but it is far from over, according to the World Bank’s chief economist. The World Bank is holding its annual meetings in Istanbul, Turkey, and those meetings prompted an assessment of the global economy from Justin Lin. Lin is the World Bank’s chief economist, and he says the situation may be improving, but the financial crisis of 2008-2009 “has left a scar”. He warns that it will be years before developing economies bounce back. Lin, meeting with other leading economists at the Council of Chief Economists Roundtable in Turkey, reminded them that the world needs to be ready for the challenge of fixing the damage left by the crisis. For example, Lin says, the residue from the financial crisis will be apparent for years, with unemployment high and consumption low. He says that India will bounce back with an 8 percent growth rate, but the country was roaring along at 10 percent before the crisis. Ethiopia, he says, will come back at 7 to five percent, and but it was showing what he called “high” rates of growth of 11 percent before last fall. But it matters far more when you are one of the World Bank’s 40 member countries with populations under 1.5 million. These developing small states gathered together at the Bank’s annual meetings in Istanbul at the annual Small States Forum to show that, when they all agree, small can be powerful. The World Bank’s small states, ranging from Suriname in South America, to Swaziland in Africa, to Vanuatu in the Pacific, met in a standing-room-only venue packed with attendees. The topic on the table was remittances, the huge cash flows sent home by economic migrants working in other countries. Almost $4.5 billion in remittances poured into small states last year, dwarfing all financial aid packages. In some countries, remittances are greater than one-fifth of GDP. Of the world’s seven most remittance-dependent countries, four are small states: Tonga and Samoa in the Pacific, Lesotho in Africa and Guyana in South America. Overall, on average, remittances matter substantially more for small states than for their large larger developing counterparts. And the worry is that remittances are drying up in the face of the global financial crunch—with a projected decline of 9 percent this year, according to the presentation by the World Bank’s Chief Economist, Justin Lin. Cape Verde’s Minister of Finance, Cristina Duarte, says remittances are a huge issue for her country, and one she eagerly discussed with her fellow small state colleagues. "We concentrated a lot on analyzing and discussing the role of remittances—how can we manage better remittances, which are an important capitals inflow for our country." The bottom-line according to Duarte: no single country can survive on its own.